Last weekend saw the people of New Zealand take to the streets in protest at the secrecy surrounding the TPPA, a Pacific-rim free-trade agreement currently being negotiated by 12 nations. These demonstrations followed earlier events voicing concerns in other potential signatories including Australia, Japan, Malaysia and the US. 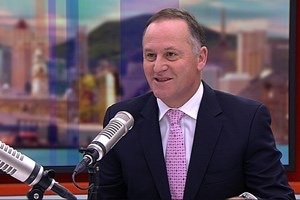 Following the protests, Prime Minister John Key gave an interview to breakfast television host Paul Henry in which he dismissed the protests. He painted a picture of anyone expressing doubt around the agreement as anti-trade, anti-business looney-left greenies, or suffering from a case of ” misinformation”. Henry, never known for objective journalism, displayed particularly sycophantic toadying by leaving this portrait totally unchallenged. Key typically employs a paternalistic, ‘we know what’s best for you so just trust us’ style of leadership. Any challenges are met with demeaning and belittling, as experienced by Man Booker Prize-winning writer Eleanor Catton when she criticised the NZ government earlier this year. Key expressed disappointment at her lack of fealty then dismissed her as, albeit a talented and intelligent writer, but lacking “political insight”. As well as the recent TPPA public protests, Key has also ignored the concerns of professionals in the industries likely to be impacted by the trade agreement. Last May, a letter signed by over 400 NZ health professionals was sent to the Prime Minister, expressing “serious concerns” about the TPPA, particularly surrounding the impact of ISDS (Investor-State Dispute Settlement), which could be used by corporations to challenge government regulations, such as those concerning tobacco, pharmaceuticals and fossil fuels. “The TPPA threatens the future of health in NZ, by elevating “investor rights” of transnational corporations over the right of the New Zealand people to develop, adapt or improve domestic regulatory policies according to changing health needs”. The medical professionals requested transparency surrounding the concessions being made in the TPPA negotiations and for an independent assessment of any deal before finalisation. These requests were dismissed by the government with the argument that trade agreements have always been conducted in secrecy. While Key obviously refuses to give credence to the concerns of ‘ordinary’ citizens, is he also willing to ignore the expertise and opinions of his fellow professionals in the fields of law, economics and politics? Last July, at the Australian Supreme and Federal Courts Judges’ Conference in Darwin, the potential harm of ISDS was discussed. In their examination of the possible repercussions of including ISDS in free-trade agreements, the example of Philip Morris taking legal action against the Australian government’s policy of plain packaging for cigarettes was given. Nobel prize winning economist Joseph Stiglitz has also expressed concern at the level of secrecy for the negotiations and the bargaining power being giving to pharmaceutical companies. Within the US Democratic Party, Senator Elizabeth Warren has made a characteristically eloquent yet powerful appeal to President Obama to reconsider his stance on the deal. Evidently New Zealanders are not alone in their doubts surrounding the TPPA and their calls for more transparency. In spite of the secrecy being maintained by the governments involved, people are not protesting blindly, but are supported by professionals and experts within the highest levels of law, politics and economics. Citing “misinformation” is a convenient way for John Key to offhandedly dismiss any dissent but the citizens are not completely uninformed and misinformed and it is insulting of the Prime Minister to suggest so.